Doing business in today's connected world means dealing with a continually evolving threat landscape. Common practice in organizational security circles as they attempt to remain secure is to upgrade endpoint protection with EPP\EDR or a Network Analytic tool. But as we all know, what’s common is not necessarily what's best. 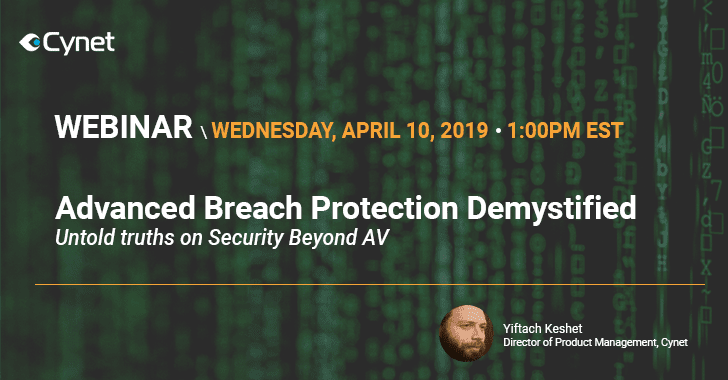 Join Cynet for a webinar on Wednesday, April 10 at 1:00 PM EST, when Yiftach Keshet, Cynet's Director of Product Management, will present, "Advanced Breach Protection Demystified – Untold Truths on Security Beyond AV." In the webinar, Cynet will take a look at the inherent security gaps no one talks about in EDR\EPP and Network Analytics. This includes an in-depth examination of attack vectors that make EPP\EDR go blind; threats that network analytics can prevent; why user behavior monitoring is integral to an organizational security solution, and finally, how you can secure all main attack surfaces.